In support to the Bio-Argo-Med cruise, our team developped a bio-argo forecasting system. Our system consists in a coupled S-Model/ECO3M-S model forced using MERCATOR PSY2V4R4 forecast for the marine part and ECMWF for the atmospheric part. The coupled models provide a wide range of bio-geochemical component and produce a daily 5 days-forecast. Those forecast are used to simulate drifters whose are compared to the Bio-Argo profils provided by Oceanographic Autonomous Observations . The position of those drifter are also forecasted and the system provids the corresponding profils. The products of the system are broadcasted at the adress : http://moc.sedoo.fr. We produce a large array of maps, section and profiles helping the cruise members to achive their goals. 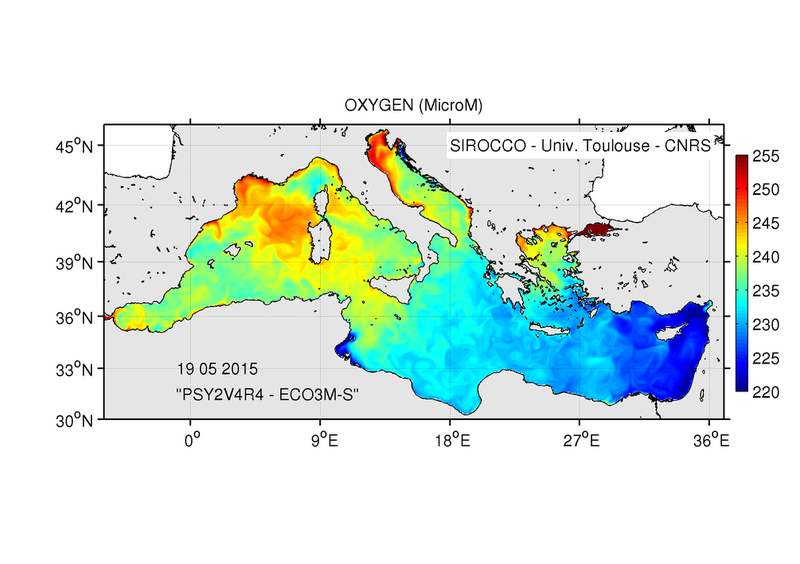 The objective of the Bio-Argo-Med cruise is to deploy a network of Bio-Argo profiling floats measuring temperature, salinity and biogeochemical parameters (nitrate, chlorophyll, oxygen, light and backscatter) in the Mediterranean Sea. These floats are developed in the frame of the NAOS project (Novel argo observing ocean system). During the cruise, floats deployed in 2013-2014 will be recovered and new ones will be deployed to replace them and to explore undersampled regions. Numerical models and satellite observations will be used to identify the places where the floats will be deployed. This cruise is a contribution to the observation Mediterranean network MOOSE and to MERMEX. The cruise will take place between 13 May and 3 June 2015 aboard the Tethys II of CNRS-INSU. The area covered by the cruise will be located the Mediterraean Sea east of 5°E excluding the Adriatic and the Aegean Sea. Durong the cruise, 10 to 14 Bio-Argo floats will be deployed depending on meteorological conditions and on the number of floats that will be recovered. Before each deployment, vertical profiles of the parameters measured by the floats, will be accurately measured from the ship with a bathythermograph to identify any errors of calibration of the float sensors. To better choose the deployments areas, information collected continuously under the ship will be analysed as well as results from numerical models and satellite images (chlorophyll, SST, SSH). MERCATOR-OCEAN will provide analyses and forecasts of hydrodynamic fields. The ECO3M-S biogeochemical model (LA) forced by these hydrodynamic fields will provide forecasts of biogeochemical variables.